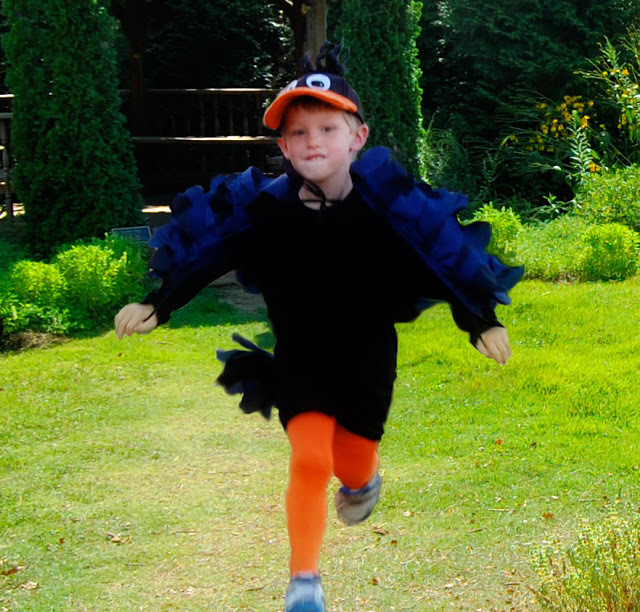 The LilMan was flipping through a party store catalog and saw a picture of a black bird, and declared "I want to be a black bird for Halloween! Can you make me one?" The Wings: with arms out, measure the child from thumb crease to thumb crease and from the base of the neck to lower back. Measure it out on craft paper, cut it out into a square, then fold in half. Then draw out how much of slope you'd like the wing span and cut. 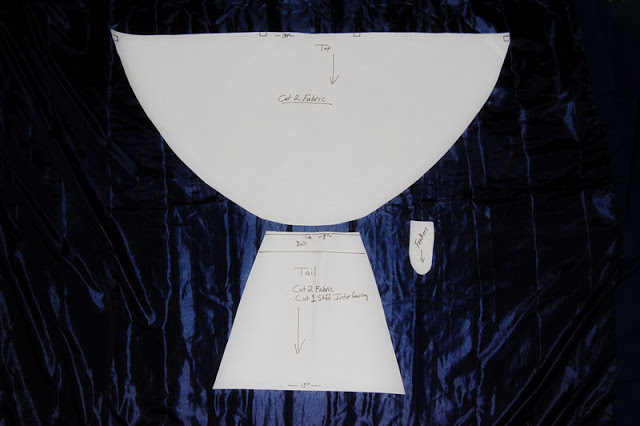 The Tail: measure the width of the waist to the length from the top of the waist to the back of the knee. The feather is 4 inches. Once you have your pattern, cut 2 of the Wing and 2 of the Tail and a bunch of feathers. 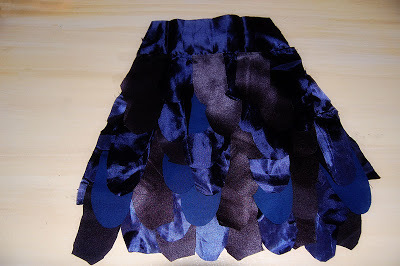 Starting at the bottom, place the feathers to the material, right sides together, sew on. Then fold the feathers down and top stitch. Place the feather rows about 1 - 1 1/2 inches apart. Continue to the top. 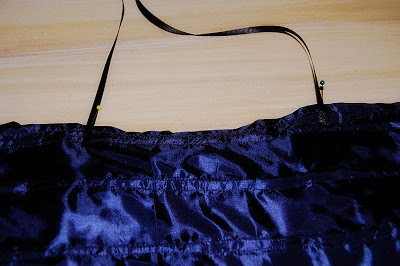 Add two pieces of Ribbon to the top, to tie around. Sew in the of ribbon. Alternatively (for Safety), measure the child's neck and cut the ribbon to size. 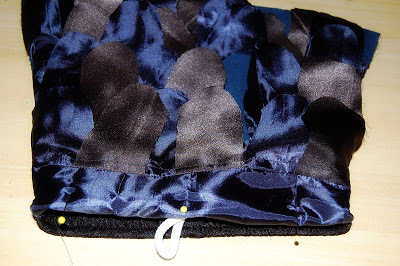 Sew one end of the ribbon onto the cape, add Velcro to the other end of the ribbon. 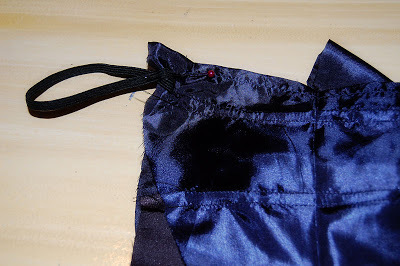 Then sew Velcro onto the right side of the fabric where the tie would attach. Take 2 strips of elastic about 6 inches long, sew onto the wrong side of the cape about a 1/2 inch down from the top. 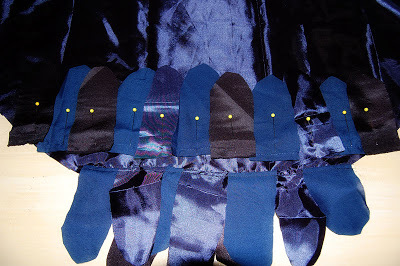 Take the 2nd piece of the wing fabric and place right sides together. Sew all the way around leaving about 6 inch opening between the ribbon to turn. (Fold the feathers, ribbon, and elastic inward when pinning. )And the cape is complete! Follow the same feather placement for the tail. 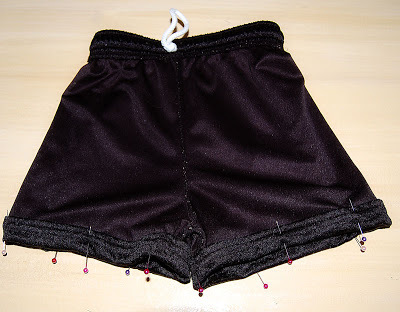 Helpful tip: To thread the elastic through, put a safety pin on each end of the elastic. 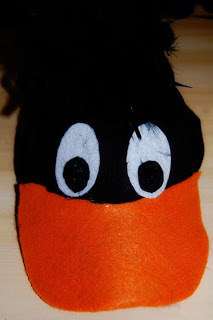 That hat, I used a paper towel to cut out the pattern for the felt orange bill, half of an Easter egg for the whites of the eyes and a quarter for the center of the eye. And cut section of a boa for the feathered top.